Each year, approximately one thousand tornadoes touch down in the US. As I watched the news coverage of tornadoes that have touched down and more in the forecast for the near future, I realized that it had been a while since I reviewed our family's safety tornado safety plan with our tween. It should not take a tragedy to motivate me to do make sure my family has done what we can to do to be safe, but it did. Here are tips to keep you safe. The NOAA National Weather Service says that the safest place in a home is the basement. If you do not have a basement, go to an interior first-floor room, such as a bathroom with no windows, closet or hallway. Stay away from doors and windows. Once in the basement, seek shelterunder a table or have a mattress or even a sleeping bag nearby that you can pull over your heads to protect your head from debris. It is more important to avoid doors and windows than it is to be in a specific corner. I was surprised to learn that the advice of going in the southwest corner of the basement is now considered a myth. Tornadoes do not always move in a straight line. Ideally, have an emergency kit in your basement. You may need to survive on your own after an emergency. This means having your own food, water and other supplies in sufficient quantity to last for at least 72 hours. Your plan should include a family communications plan, including knowing how you will reach other should you get separated, who are the approved grown ups who can pick kids up from school and who kids can call if they are home alone during an emergency. 2. Practice that plan. NOAA recommends that families practice a tornado drill at least once a year. 3. 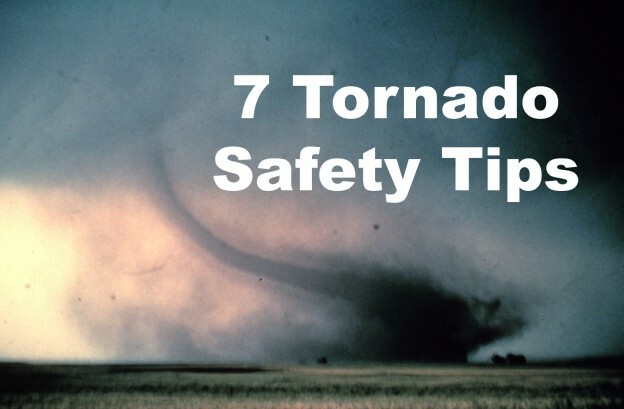 Talk with your child about their tornado safety plan at school. the interior hall or room in an orderly way as you are told. Crouch low, head down, and protect the back of your head with your arms. Stay away from windows and large open rooms like gyms and auditoriums. Talking about the school plan is a good way to both reinforce the procedures an a chance for you to make your child feel secure. Even tweens need that sometimes. Communicate that you are confident that the school has a plan in place to keep them as safe as possible, just like you do at home. 4. Keep the windows closed. Some parents may remember when advice was given to open windows in the home to equalize pressure. That is no longer recommended. NOAA's website says, "Opening the windows is absolutely useless, a waste of precious time, and can be very dangerous. Don't do it. You may be injured by flying glass trying to do it. And if the tornado hits your home, it will blast the windows open anyway." 6. When driving, either leave the vehicle and seek shelter or exit your vehicle and find a low area where you can lie on your stomach. Do not seek shelter under a bridge or overpass. That is another myth, as is trying to out drive the tornado. 7. Download the Red Cross tornado app. The app is available on iTunes and Google Play stores. It's has of information on preparing for tornadoes and staying safe, and the app is free. Please share this important information with those you love and those in your communities, both online via social media and in real life. you can text RECROSS to 90999 or text GIVE to 80888 for the Salvation Army. Each is an automatic $10 donation. You can donate online to the Red Cross Disaster Relief fund here, and the organization also suggests giving blood at your local hospital or blood bank. United Way of Central Oklahoma’s Disaster Relief Fund is open and you can make donations online here. Feeding America plans to deliver food, water and supplies to Oklahoma, and you can donate online here. The post "Talking with your kids about tragedy" may be helpful when discussing the loss at the elementary schools in Oklahoma.